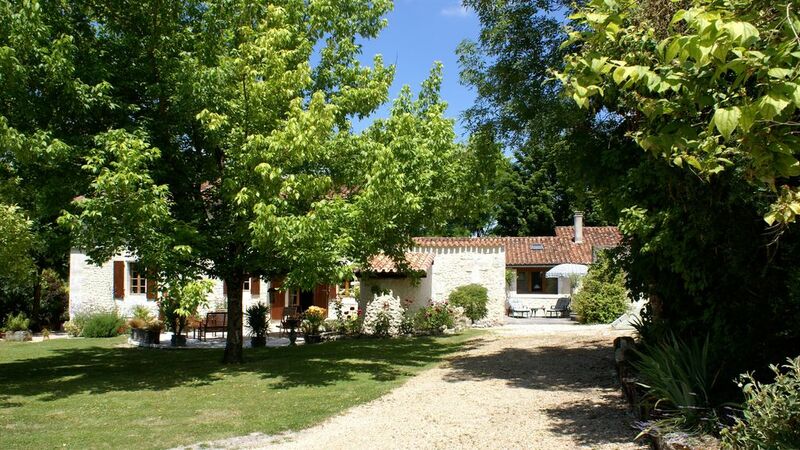 Nestling on the hillside between the picturesque Roman villages of Bouteilles and St Paul de Lizonne, in a pretty and interesting corner of rural south west France, this former tobacco farm has been lovingly restored, retaining a traditional French country feel. Centred around a shaded courtyard, L’Erable is a charming conversion of one of the ancient single storey barns, sitting alongside the main farmhouse inhabited by ourselves. L’Erable is an immaculately presented, light and airy house radiating warmth and a friendly atmosphere. The carefully designed interior centres around the extensively equipped farmhouse kitchen. Attractively furnished to compliment the many traditional country features inc. beams and mellow stone walls. French doors permit the sun and warmth to filter in from the courtyard, benefiting from two pretty terraces, back and front, both with comfortable furniture on which to enjoy the tranquil country surroundings. SAINT SEVERIN: Situated just 3km from Saint Severin, where you will find all the usual village shops, butchers and bakers, as well as grocers, bank, chemist, newsagents, Post Office, doctors etc - not forgetting 3 bars/cafés and small family hotel with restaurant. Air condition in the 2 double bedrooms. This property provides you with everything needed to ensure a great stay. The kitchen is very well equipped with two ovens and a big fridge/freezer which is great when there are six people. It also provides cold filtered water and ice cubes which we made great use of. The pool area offers sun and shade which was great as the weather was hot. The surrounding towns offer nice days out if you want to leave the house and pool. We would love to go back, which we rarely want to do. Do we really have to go home?? What a lovely surprise awaited us in France, this must be the nicest property we have ever stayed in and we have stayed in quite a few on our many trips to France. The Barn was absolutely beautiful, from the furnishings, the huge TV, lovely bedrooms and bathrooms, all we could have hoped for and then some. Linda and Nigel have thought of everything, some things we needn't have taken with us. The kitchen was more than well equipped for all of our meals, a fantastic fridge freezer so plenty of cold water and ice on hand. Linda and Nigel were around whenever we needed to ask a question but never invaded our space. The pool was brilliant, warm and clean with plenty of sun-loungers for that serious order of the day - sun bathing! They also provided a really lovely welcome pack for us with wine, butter, fruit and jam, totally unexpected but very welcome indeed :-) A real home from home and a place which we would highly recommend and somewhere we hope to return to. Thank you again Linda and Nigel for making our holiday so enjoyable. We stayed here for two weeks but would have quite happily stayed much longer. This immaculate house is in a lovely, peaceful location with Nigel and Linda on hand next door should anything be needed. However, they are totally discreet and will not intrude. They have managed to provide a beautiful holiday home with everything you could possibly need for a comfortable stay. They really have thought of everything! We have stayed in various holiday homes in France and they were all lovely but this is exceptional! Should we stay in this area again we wouldn't hesitate to re-book. Due to a cancellation we now have empty weeks during August, will vary on arrival day if needed. Notes to the rental rates •	Reservations are for a 1 week minimum period. •	30% deposit confirms a reservation. Balance due 8 weeks before arrival. Rental charge includes all outgoings (electricity, water, logs for the open fire etc.) as well as full oil fired central heating in the barn from late autumn through to early spring ensures the house is always warm and comfortable. All fresh linen is included.